This is the first edition of an online magazine about the diverse art of Thailand. Magazines and books about Thai art exist, but they are usually written in Thai and inaccessible to foreigners. We hope to bring the art of this wonderful and ancient culture to a wider audience. Unless you physically travel to Thailand and know something of the language, it is almost impossible to get far in the exploration of Thai art. Using the visual power and worldwide reach of the Web, we intend to bring this rich artistic heritage to people who do not have that opportunity -- not in dry scholarly language, but in full, living color. 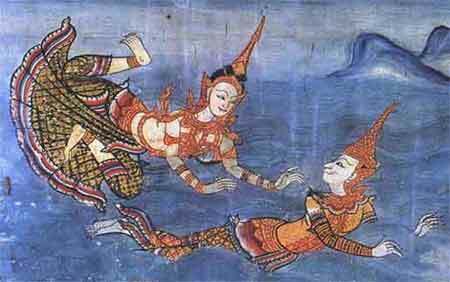 Whether it is modern or ancient, Thai art is deeply rooted in Eastern mythology. It has its own cultural context and its own visual language that may be lost on many westerners. Just as it is impossible to fully appreciate European Renaissance art without some knowledge of the Bible, Thai art cannot be understood in a vacuum; it both reflects and shapes the Buddhist culture that surrounds it. A westerner may know of the lotus and its many parts, but may not be aware of its significance in the daily rituals of the Thais. Someone from the West is likely to forget to take off his shoes before entering a house. And without intensely studying Buddhism, one may not know the reason why all the Buddha's fingers are the same length, why his topknot of hair turned into part of his skull bone, or the significance of the flame atop his divine head. Thai art uses a highly stylized line to portray such common things as the lotus flower, animals, and people. But there is nothing common about these objects in the context of a mural painting. A lotus flower can mean many things: a spiritual offering, the symbol of life, or even divine support for a walking Buddha. Animals may be portrayed as regular beasts or special creatures from the Himmapan forest. Thai style line drawing is called Lai Thai. Sometimes, a human is depicted as merely a human but with dress and behavior that illustrate the lifestyle of their time and place. 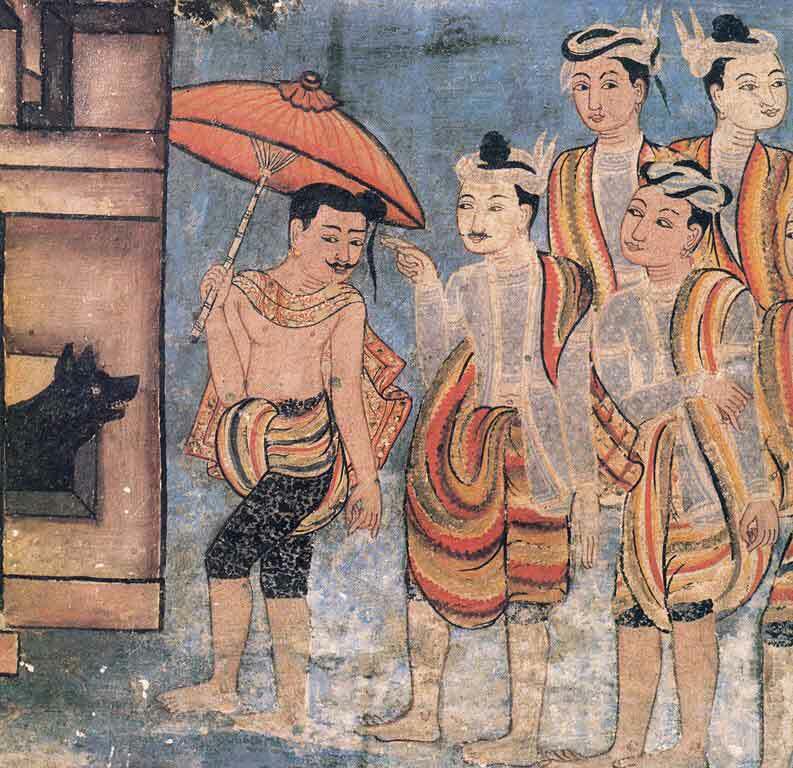 In this mural painting from the northern province of Chiang Mai, the style of dress is unique to the region. Notice the tattoos on the legs of these men. When a person is portrayed with elaborate decorations, then he (or she) is a representation of the Buddha in one of his many incarnations. The human form can also be used to represent royalty or angels by the application of gilded, gold crown and accessories. These ancient conventions are still relevant in modern Thai art. Mahajanaka is being rescued from a shipwreck. Mahajanaka is one of the incarnations of the Buddha. From Wat Matchimawat, Songkhla, a southern province in	Thailand. Many different ancient cultures came together to form what we see today. Thai literature is composed of stories that migrated up from India with the advent of Buddhism some 2500 years ago. These stories are metaphorical interpretations of the struggles of life. And they are rooted in a world quite different from that of Africa, Europe, the Middle East, or the Americas. When this migratory culture mixed with the ancient Cambodian empire already in the region, a wonderful new style of art began taking shape. 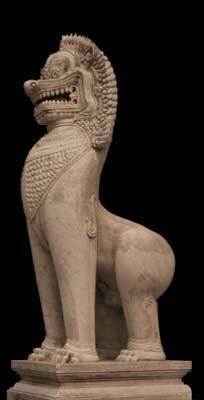 A Cambodian style lion or Sing in Thai, this sculpture can be found at Wat Benjabobit, Bangkok. 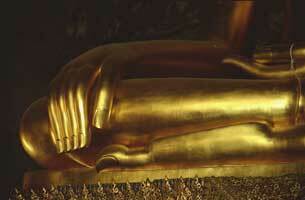 Thai Art Magazine will bring you great images found in bustling Bangkok and in remote places. Our faculty is composed of experienced artists, musicians, and web programmers. We are a diverse group of people with different backgrounds and religions: Buddhist, Muslim, Christian, and Jewish; American, Thai, and Chinese. We will explore Asian mythologies and the modern world in an attempt to better understand each other and the problems of our modern world. We will compare the art we know with the art we are just beginning to know. And, of course, we will look at art for art's sake. All rights reserved. The content on Thai Art Magazine may be reproduced with express consent from SamForkner dot Org. Copyright © 2005, 2011 Bangkok, Thailand.